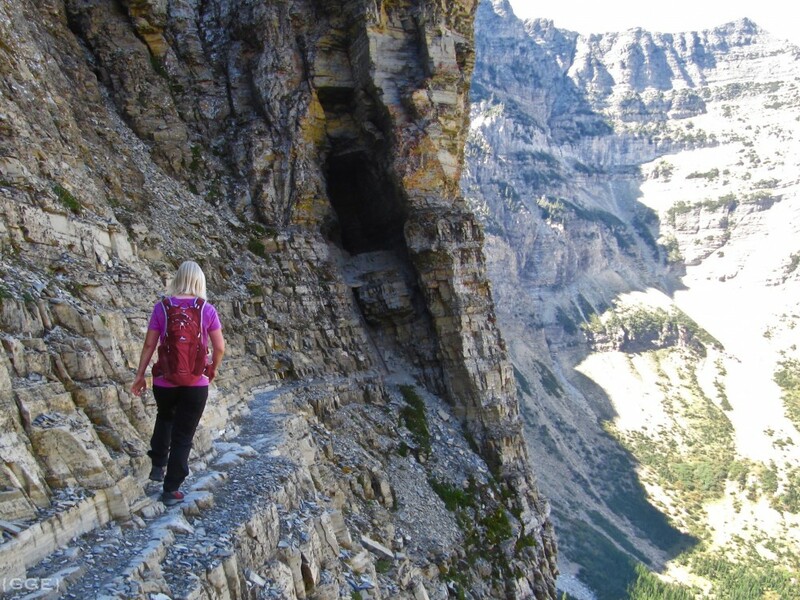 After reading the introduction to this famous hike in Waterton Lakes National Park in our hiking guide there was no doubt, this was a hike we had to do! This hike offers gorgeous waterfalls, views over Hell Roaring Valley and end at a lovely hidden lake about 1970 meters above sea level. But that is not what has made this hike famous, you can thank the airy route which includes a ladder, dark tunnel and safety cable for that. That is probably what made this hike make the 2014 list of ‘World’s most thrilling trails’ by National Geographic. 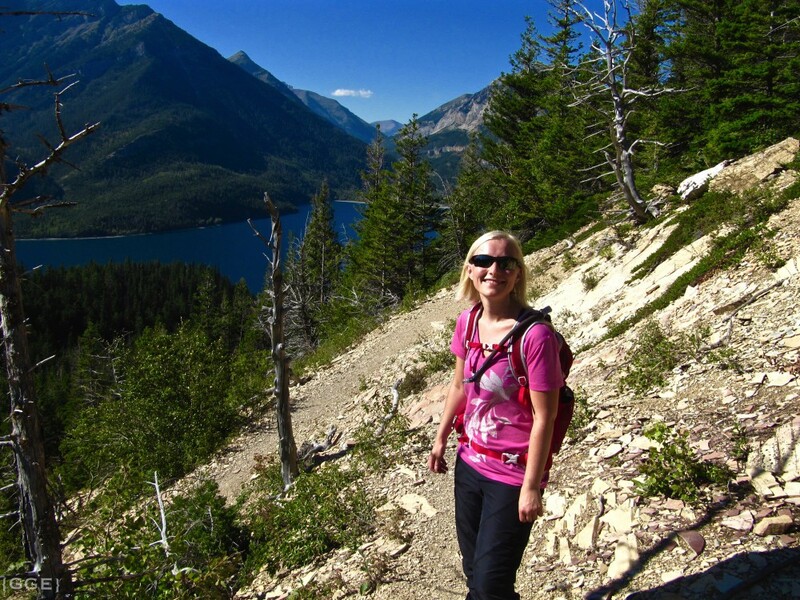 This hike starts with a short boat ride from the docks at Waterton Village across Upper Waterton Lake to Crypt Landing where the trail head is. 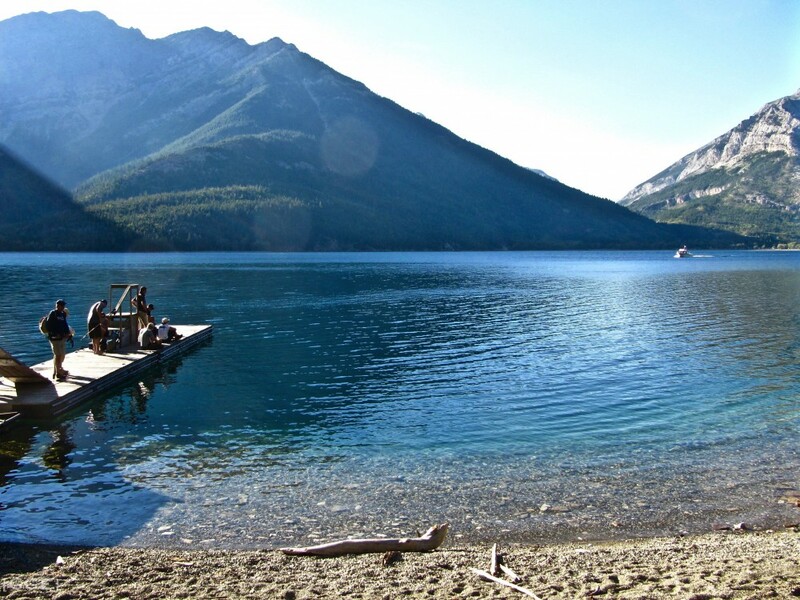 Crypt Landing is nothing but a dock for the boat to land on so bring everything you need for a full day out and make sure you are back for the last pick up to bring you back to Waterton Village. Before you start ensure you have a bear spray with you, this is bear country and Waterton has a high density of these fury friends. An encounter is not completely unlikely, they do however usually end well. Best way to avoid bears is to hike as a group and make noise. If you are alone you are sure to find someone to hike with as this is a popular trail and you will not be the only one heading towards Crypt Lake. The hike starts at the shoreline and it takes a couple of kilometres before you build enough altitude to get views, but once you do you basically watch down on Hell Roaring Valley the rest of the hike. You will pass nothing less than 4 waterfalls on your way towards Crypt Lake. It is not before the last couple of kilometres before the lake the hike starts getting nerve-wrecking. At this time you start to realise how airy this hike is about to get. After passing a scree you get your eyes on the earlier mentioned tunnel. To get there you have to pass a narrow shelf with a huge drop below it. I stayed as close to the rock wall as possible. The section between the scree and the tunnel is not long, but it definitely got my adrenaline level up. The ladder at the end of the narrow shelf will help you get up to the tunnel. 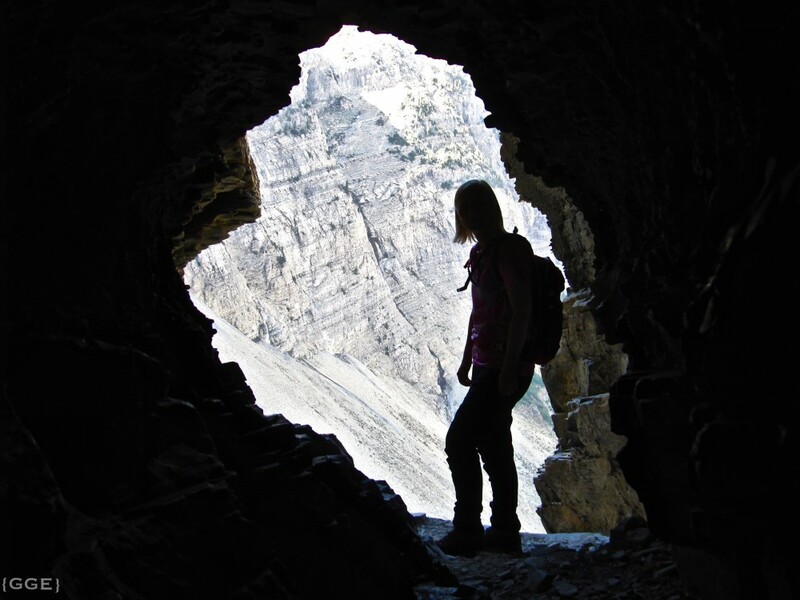 The tunnel is not natural, it was blasted out to make the hike to Crypt Lake easier. I can’t imagine how people were able to get here before the tunnel. On the other side of the tunnel the airy hike continues as you cling on to a safety cable to get around a rock band. Ok, clinging might be slightly exaggerated but it was a thrilling section of the hike. If you didn’t turn around at the narrow ledge, the tunnel or at the sight of the safety cable you will be rewarded with emerald green waters beautifully surrounded by mountains when you reach Crypt Lake. 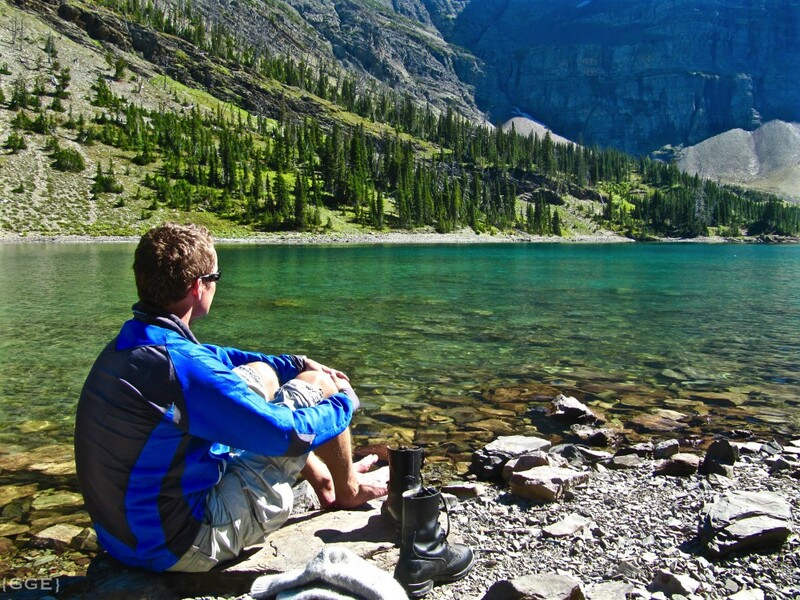 How long you get to enjoy the lake depends on how fast a hiker you are. Last pick up at Crypt Landing is usually 17:30. Make sure you check the latest schedule with Waterton Shoreline Cruise Co who run the shuttle service. Reservations are usually not required. And did I mentioned the group arriving back at the dock 20 minutes behind us got delayed as they had a black bear and her cub cross that trail just in front of them. Thank you for reading! Please leave a comment, we’d love to hear what you think. Do you have an exciting hike you would recommend? Have you done any of the hikes from National Geographic’s ‘World’s most thrilling trails’? admire such a landscape. Your photos are wonderful. Thanks you very much Hervè! It was such a fun and a bit scary hike. Appreciate you comment, thanks for stopping by! What a beautiful hike! 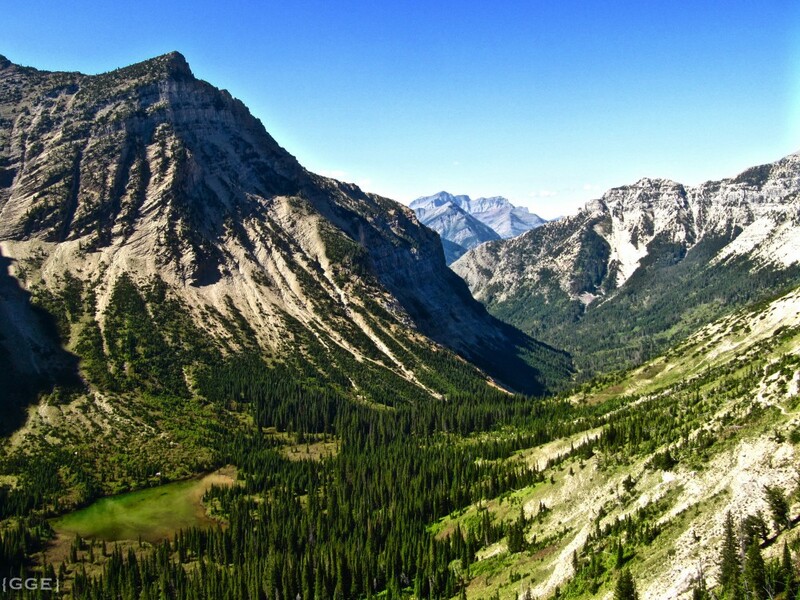 I wanted to go to Glacier Park in Montana with my father, I need to make sure to head up to Canada now for it. The narrow shelf picture made me uneasy though haha. Oh my, too beautiful ! Really love all your photos with that enchanted lake , and those inspiring rocks…. Thanks a bunch Ingrid! I guess a little bit of excitement is healthy:) I am happy it was the other group and not us encountering the bear. I am not sure how I would have reacted! That looks stunning, not sure I could make it past the narrow shelf but it looks like it is worth it. Yikes, I wouldn’t have dared walk that narrow part! I wonder if anyone’s fallen? I also didn’t realise that bear spray existed! 🙂 I need to spend more time outdoors! I had not even heard of this hike but now it is on the list. 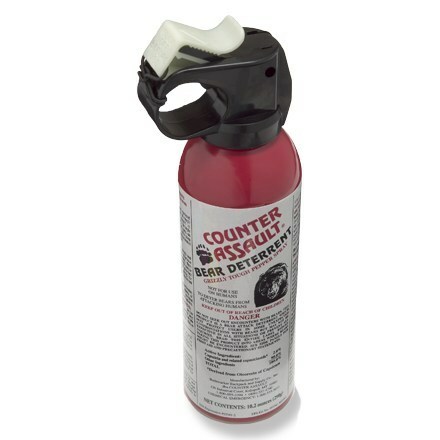 Bear spray definitely sounds like a good idea! I was sure everyone around here had done this one. It was definitely a fun one. For those doing via ferrata and such this one is a piece of cake. You could do it blindfolded:) Bear spray is definitely a good idea, lots of them in Waterton! I want to do this hike! I am sure my adrenaline would be pumping but it looks fabulous! 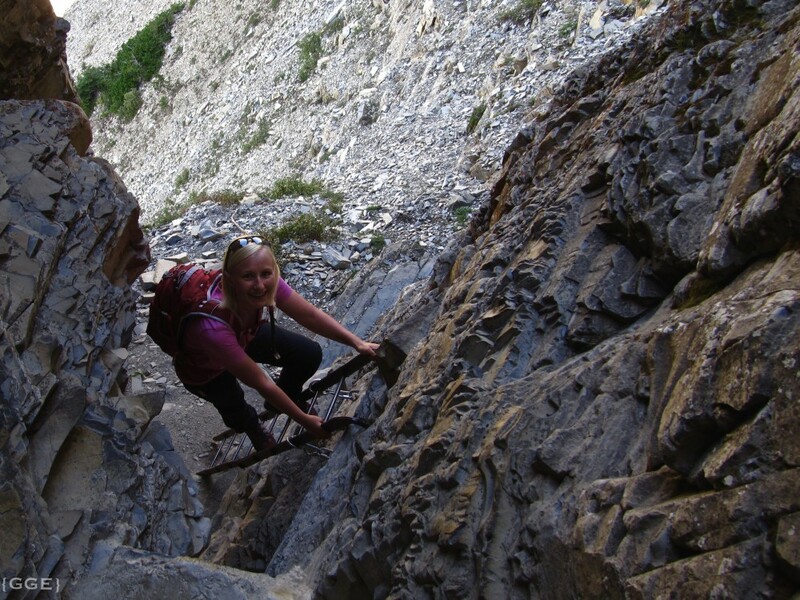 I am so glad you showed us this hike, Inger…as I am WAY to chicken to go out on that ledge! :). That is an amazing hike! Wow, just wow. I would love to do that hike if I ever make it back to the Rockies. Those views look incredible! (But the ledge looks terrifying!) it would be really interesting to see bears from a distance! Because of my fear of heights I would never never go that trail. 😉 But the landscape looks so amazing. Thanks for showing us! I am sure you would have made it just fine! No real danger (as long as one don’t faint I guess). I agree, the landscape is beautiful in Waterton. Thanks for commenting! Several thoughts. First, of course, the incredible beauty. Second – a ride back! Wow! What a gift at the end of a long hike. Third, I like the new name for your blog. It is shocking to me, though, because my latitude is about 31. Makes you seem w-a-y north! 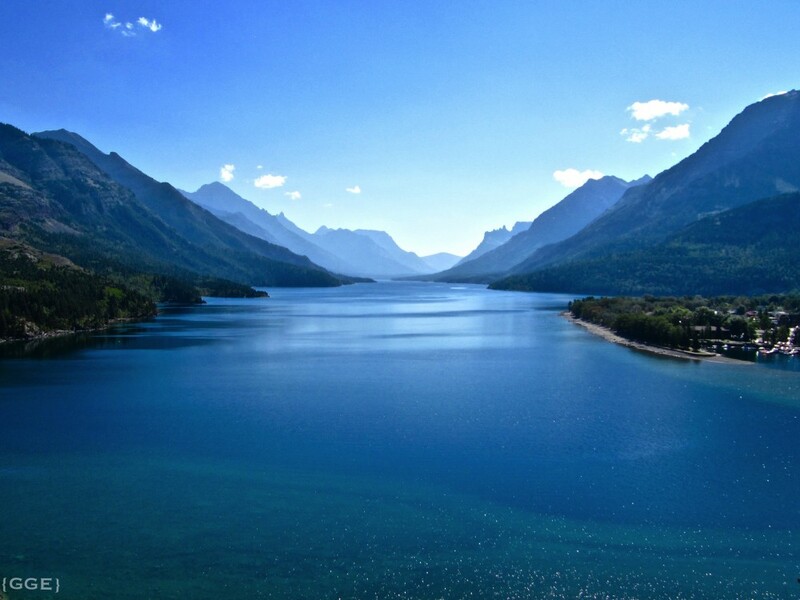 Thanks a lot:) Waterton is a lovely spot to visit, one of my favourites:) Thanks for visiting! No words…but I will give it a try: stoooopendus! Fabyoooolohsoh!! Maaaahhhhvelous! And finally – a personal favorite – WOW! My favourite must be Fabyoooolohsoh!! 🙂 Thanks for stopping by! What a thrilling hike it must been! This hike is definitely not going to be on my list. Lol. The narrow path with huge drop on the right would be too much for me to handle. But I get to experience trail with you through your blog so thanks! Beautiful lake. . Nothing like a clear mountain lake. Thank you for sharing! Amazing photographs Inger, the scenery is… well, I’m speechless! And “Hell Roaring Valley”, what a name! Superb post! That is a stunning hike, but it is probably not for me. Although I love the mountains, I have a fear of heights/falling that would cripple me on that trail. Great, dramatic photos. Thanks Jeff! It was quite a scenery, especially those airy sections. I definitely had butterflies, but was able to make it across with my encouraging husband behind me: ‘let’s go, people are waiting!’ Hehe… Thanks for commenting! That water is pristine! What gorgeous scenery! Wow! What a hike, lovely photos. You encourage me to get out and get moving this morning. Thanks for the kick and adrenaline! Have a wonderful week! 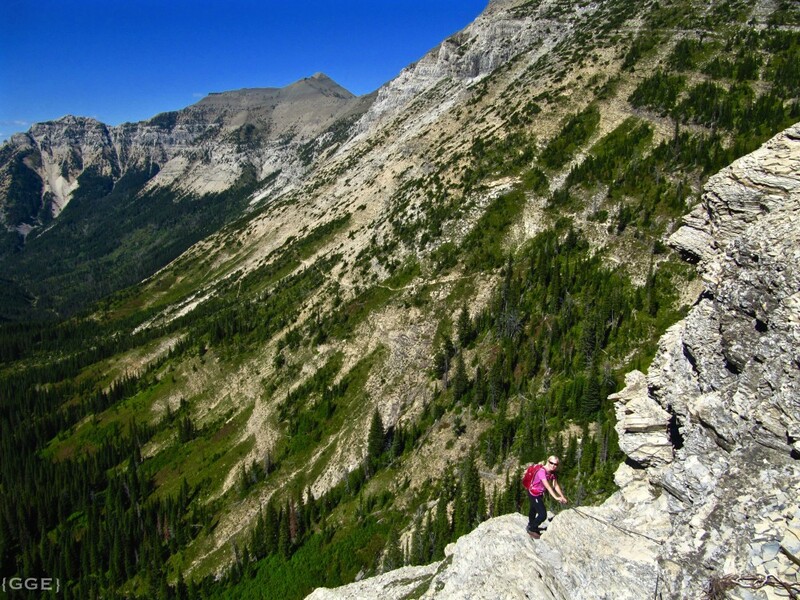 If you ever decide to go for this hike you’ll definitely get that adrenaline going! 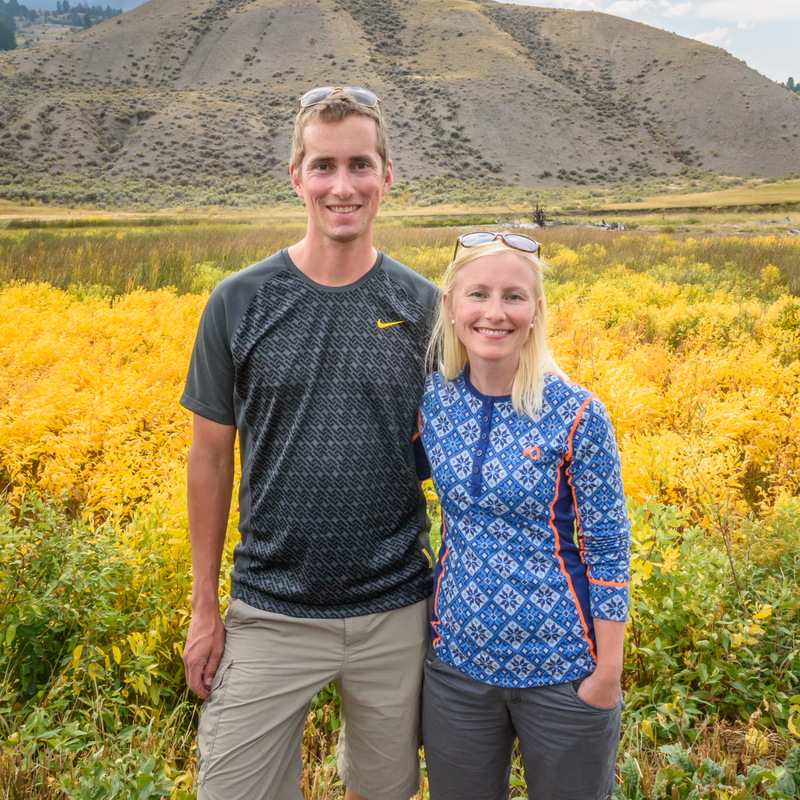 We went out for a hike last weekend as well (not as adventurous as this one) – it is such a lovely time of the year for hiking in the Rockies! 🙂 Thanks for commenting! Gosh Inger, what a beautiful place! And bear may included during the hike 🙂 – that’s truly fascinating view from up there! I will check the list, thank you so much for the tips and inspiration! That lake is just beautiful. Inger, that is one amazing trek, the scenery is amazing. I think I might be a little scared atop the narrow shelf by the tunnel. The wind would have my nerves shaking. You take wonderful photos. I wish to visit there someday. It would be a hike of a lifetime. The pristine lake at the end of the trail was definitely a sweet reward. Too bad I didn’t bring a swim suit – and it was a bit too crowded for skinny dipping:) Thanks for commenting Randall! Omg this hike looks so scary and awesome! Gonna have to add this to my bucket list! What a beautiful place. There’s no way I’d have done the ledge and ladder to get to the tunnel, you’re very brave. Thank you so much! The ledge wasn’t too bad, I was expecting it to be even worse after reading the trail description:) Some encouraging words from my husband and whoops, I was passed the worst part. Thanks for commenting! Wow, that was an amazing hike, great views and nerve-racking adventure! Love your photos. BTW, thank you for visiting my blog, and liking my posts. Thank you so much Lena! It was one of the best hikes we have had in the Rockies. I’d recommend it to anyone. Thanks for stopping by! Inger: Great series and thank you for the, Like, on my White Cone Plant. Wow! I love hiking, but haven’t indulged in it for awhile. Your beautiful photographic journal is so inspirational. 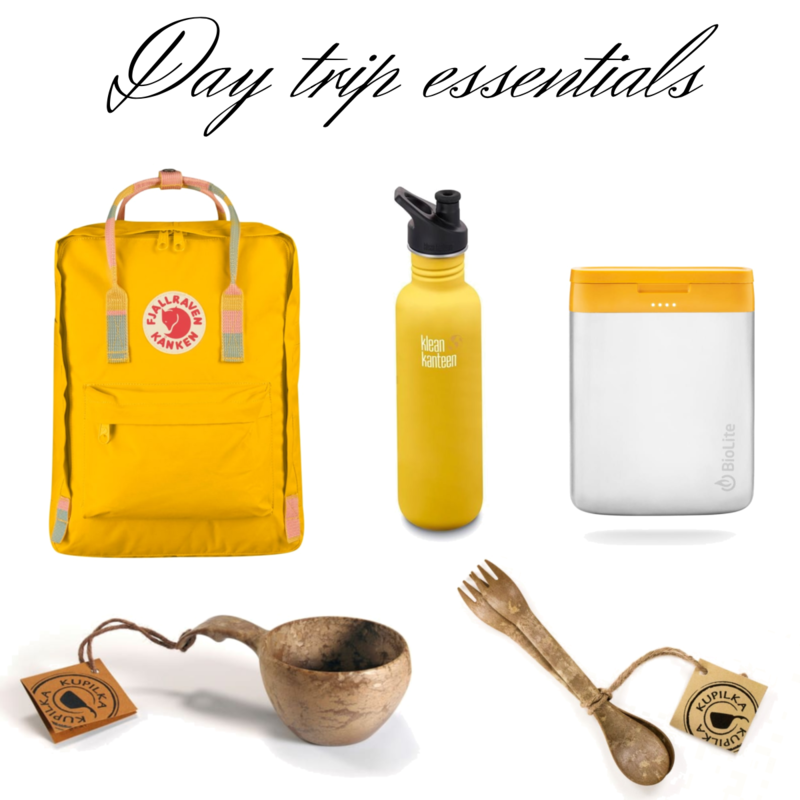 Thanks for sharing your travels in such a luscious way. Thanks also for visiting Mocha Muse and leaving a couple of likes! Oh wow I’d love to do this hike one day. I bet you were in the area when you drove up to Calgary? Did you stop by Waterton? I am glad you did this and shared your pictures. This looks way out of my league, was glad to go along on your camera. I am sure you would have no trouble what so ever:) It was a lovely hike! Just don’t look down when you reach the ledge;) hehe… Thank you so much for stopping by and taking the time to leave a comment! Just do it! It feels so great and it is always awesome to be out in nature away from the laptop. Really clears my mind:) The ledge was a bit of a challenge, but what a scenery!! 🙂 Thanks a bunch for stopping by and taking the time to leave a comment Becka! I’m putting this one on our list. It sounds amazing.